Learning how to read feline body language is one of the best ways to understand your cat. Even though cats express themselves vocally, they primarily use their face, tail and body to communicate with each other and with the humans in their lives. Watching a cat’s eyes, ears and tail can speak volumes about what the cat is trying to tell humans or other cats. A cat’s eyes can give you many clues about her emotional and mental state. Wide open eyes are an indication of trust. Eyes that stare without blinking can be an attempt at dominance. A slit-eyed look can be a sign of aggression or fear. This is different from the sleepy-eyed look, when a cat appears to blink at you, which is generally thought to be a sign of affection. Since cats know how to interpret these signs between each other, they’ll most likely also interpret them in the same manner when they are coming from you. Never stare directly at a cat you don’t know, this may prompt an attack. On the other end of the spectrum, if your cat sends you a “slow blink,” return it. Your cat will interpret it as “I love you” in feline speak. A relaxed and happy cat will have her ears pointing slightly to the side and slightly forward. If the ears go straight up, something has captured her attention. Twitching ears usually indicate nervousness or fear. If the ears start moving backwards, it’s an indication that the cat is getting annoyed or frightened. This is a clear signal to back up. If it happens while you’re interacting with your cat, stop doing whatever it is you’re doing. Ears flattened backward against the head show a cat in full aggression mode. The cat’s tail is equally communicative. A friendly and relaxed cat will have her tail straight up into the air. The tail may even quiver: this is a sign that the cat is happy to see you. A cat whose tail is straight up in the air, but with a slight curve in the tip of the tail, is still happy, but perhaps, a little bit unsure. A tail extended straight back is still a friendly sign. This could be considered a “neutral” gear. The cat is not fearful or aggressive. 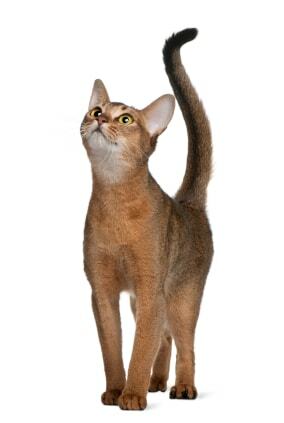 A tail curved around the cats’ legs like a statue shows that the cat is alert and interested. Once the tail goes straight down, this signals the beginning of aggression. A slight curve at the top of a tail that goes straight down may express a slightly aggressive, defensive stance. Watch out if your cat’s tail become puffed up: this is either a sign of aggression, or fear. Approach with caution. A swishy tail indicates anger, excitement or irritation. Learning to watch and understand your cat’s body language can help mitigate problems in a multiple cat household, and it can go a long way toward avoiding any misunderstandings between cat and human. 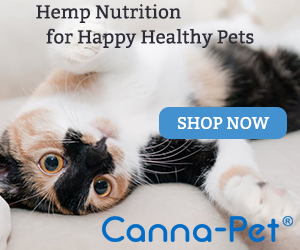 Your cats will thank you for it. I’ve read many books and articles on cat body language but never get tired of reading more about it. I always learn something new. We all need to understand our cats’ body language so we can know how to approach them or calm them if they are afraid or stressed. I look forward to seeing what’s new on The Conscious Cat each day. Thanks for providing so many interesting articles about cats! I’m so glad you enjoy our updates, Connie! We have two cats, both 10 year old neutered males. Indoor only, perfectly healthy. Zero medical history. Current on vaccines, etc. About a month ago we purchased a new toy. It’s basically a mouse on a wire, and a wand. There’s no catnip or any other attractant/stimulant on the toy. They go nuts for this thing. Unlike any other toy they’ve had. Here’s the odd thing. One of the males will catch it then hold it in his mouth then clench his hind section repeatedly. It looks like he’s trying to defecate. A link to a video of him doing it is below. He only exhibits this behaviour when this particular toy is in his mouth. He drops the toy and the behaviour stops. It’s not a digestive issue, that’s all fine and unchanged. It’s not neurologic. I understand neurology quite well. It’s behavioural. I just don’t know why he does it. This doesn’t appear to be anything harmful. I’m just really curious. We’ve had cats for 4 decades and never seen any do this. Can anyone tell me 1) if they’ve ever seen this before and 2) what is the underlying purpose for the behaviour? I’ve never seen this type of behavior before, Rich. I’m curious, too, to find out what could cause this! Me too. Do you know of anyone who might be able to answer this? I don’t keep up with the who’s who of feline behavior. You could consult with a feline behaviorist. I refer to Marilyn Krieger or Pam Johnson-Bennett. Sounds clearly like a sexual movement, to me. Males bite the female on the scuff of the neck during mating, to hold her in position. Your boy might be desexed, but he’ll still have urges to carry out these behaviours, even though nothing much happens and he becomes confused. It is harmless. Don’t worry about it. I love how people have a personal bond with their cats, almost like a baby. They make a noise or sound and we seem to know what they want. I am a crazy cat lady when it comes to talking/reading my cats body language. 🙂 Seems silly but like my son when he was young I know what she is thinking or wants. Hi I have two cats one is very sweet. Both are rescues my younger cat,(a little over a year ) was a nice cat to start out but now he always puts his ears back when I go to pet him or my mom does or when we pick him up . We have no idea why though. We do not swat our cats ever so it’s not from being fearful of being hit. What else could make his ears go back all the time!? Any sudden change in behavior can be an indicator of a medical problem, Amanda. I don’t know whether that’s the case with your kitty, but it’s not something that I would consider normal. Gizzy sounds like a sweetheart, Aundrea! I had/have the same issue with Sunbeam as Jackie, with the added bonus of throwing herself down in spots to stop me, then get up and continue on. Like Sara I made careful observations (isn’t that what we are here for, in their eyes anyway?) and found that she was trying to let me know something was ‘not right with the world’. She has even saved me from what could have been a disaster or tragedy; escaped cat, strange dog in the yard (we have a small outdoor colony we care for), an interactive toy left out(she knows certain toys are always put up in an out of reach hanging area) other things I can’t think of right now. It made me start to notice that all my other cats are trying to communicate to me in too when things are amiss, just not so dramatically or persistently. She is a bit of a drama queen and the other cats not so persistent as I didn’t pick up on their more subtle warnings. Great information by the way. Cats always communicate with us, we just need to learn the language. From our small sample here, it definitely sounds like this type of behavior is intended to warn humans of something, doesn’t it? A cat who is really really happy to see you will have a straight up in the air tail that vibrates . You have to look closely to see this. I had always heard that the slow eye blink was kitty kisses, but read an article somewhere that said it means – hey, I’m harmless, no worries. Our cat, Suzie, always has her tail high. She is so sweet. When it is dinner time she is very talkative. She sleeps right next to my side everynight and loves to havs her tummy rubbed. Cats are the best owners to have. These signs are so indicative of what a cat is feeling. Understanding your cat is key to a great relationship-it helps to know when to engage and when to let them be alone. Now this I’d love to see, Trish! So, funny, those tails really talk! I thought this was a wonderful article. Angel does the winking one a lot. She’s such a flirt and a happy girl. I have a question, my Angel does this walking ahead of me, stretching out as far as she can and then just stops and stares up at me. It seems she’s almost challenging me to go any further. She’ll do quick little spurts of chatter. Could she be showing dominance? I’m so curious. I’ve talked with other pet owners and they haven’t experienced it. That’s an interesting combination of body language, Jackie. It almost sounds to me as though she’s trying to get you to follow her to show you something, and she’s making sure that you “get it.” What happens if you keep walking? Does she then keep walking ahead of you? Yes, she keeps walking ahead of me, still looking at me and chirping. I call her my little sentry. My son is sure she’s protecting me in her own way. I did have some serious health issues. She must just want to be sure her mamma is OK. Oh, I love her even more now. Thanks, Ingrid. I used to get frustrated with my cat when he’d do that because I’d almost trip over him sometimes. After a while though, I figured out that he was trying to communicate with me (he’s a VERY vocal cat). Once he starts doing that now, I stop and literally ask him what he wants. I always do it in the same tone of voice with hand gestures, so he’d understand what I was doing. Sometimes I’ll tell him that I don’t know what he wants unless he shows me (I may sound crazy, but it works!) Now when we have this exchange, he’ll walk to whatever is bothering him, but always stops to turn around and meow at me to make sure I’m still following him. Now he does this if his food or water is too low, he can’t find our list a toy, he wants to play, etc. It’s pretty awesome that we can have this exchange! We also play the winning game. It cracks me up because he’ll do it while he cuddles with my boyfriend. I love how you communicate with your cat, Sara! It doesn’t sound crazy to me at all. That is a good idea, Bobbi, but Angel grazes so she always has her food and fresh water at the ready. They are so sweet and neat but still very mysterious. I guess with my girl, I’m thinking she might be checking everything out to see if it’s all safe for me. (Maybe because that’s what I want to believe). She does look ahead then back at me. I wish she could really talk. 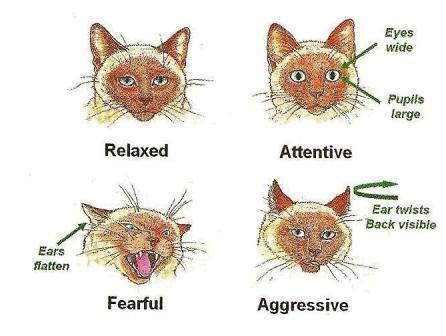 Once you learn the body language of your cat it’s fun to use it too….especially the eyes. I had a dear cat many years ago who used to love playing “wink” with me from across a room…..first left eye, then right, etc. Cute game. We were so close I believe we could read each others’ minds! LOL Interesting blog Ingrid – learning what our cat is communicating to us and others is so important. That’s so cute, Pam. I love the eye blink exchange. All of my cats have done that and are doing it. Even though most cats seem to have an everyday vocabulary to a certain extent, it’s become clear that is mostly for our benefit–when among themselves outside of human contact, such as a stray and feral colony of cats, body language is the exclusive means of communication so it’s also the most natural way for cats to tell us what’s up. 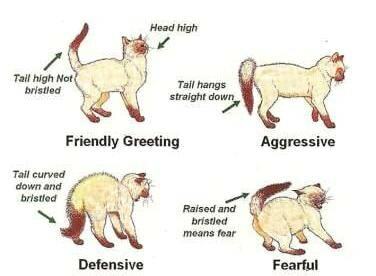 I remember learning about felne body language years ago, and using their own language to make myself the “dominant” personality but more like a momcat dominant. It advised making eye contact and staring right at your cat without blinking in order to make the cat listen to you (remember, this is nearly 20 years ago!). It did convince a few of my cats to stop doing things I didn’t want, like eating plants, at least for the moment, but my fearless deaf cat Sally took it as a challenge and went right for my face. End of lesson. Sally sure put you in your place, didn’t she, Bernadette!